Coming right on the heels of Brenda Braithwaite’s talk on Train—a board game about the holocaust that has brought many of its players to tears—John Teti led a hilarious panel on humor in games. 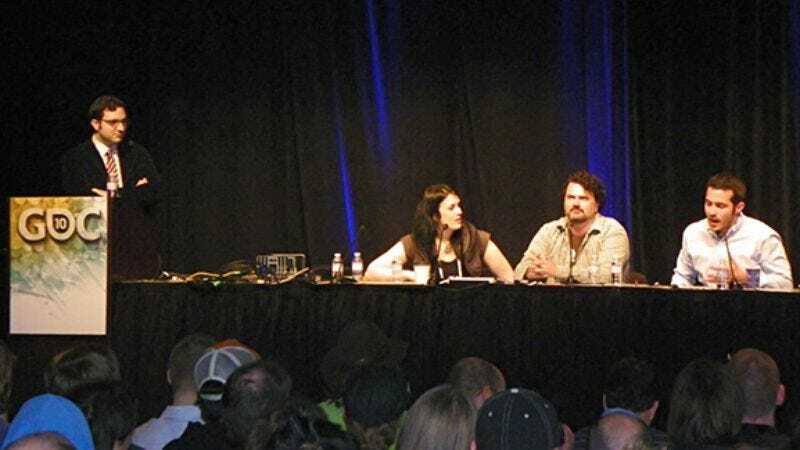 Teti moderated a discussion with writer Rhianna Pratchett (of the Overlord series), the legendary designer and writer Tim Schafer (most recently of Brutal Legend), and Sean Vanaman of Telltale’s Tales Of Monkey Island games. “Unless you’re funny,” quipped Schafer. Scripts can be funny. Cutscenes can be funny (but we’ll still skip them). But how about humor that emerges from the gameplay? Pratchett talked about the minions that follow the protagonist in Overlord, wearing funny hats made out of baby seals or pumpkins. I’ll vouch for Pratchett that while I didn’t get belly laughs during Overlord or Overlord 2, the gags definitely set the tone: the game came off as wicked, but never nasty (which would get old). Speaking of Sims, Pratchett also brought up an experiment in Sims 3 by Robin Burkinshaw, who created a homeless father and daughter and put them in the game to see what would happen. It’s a provocative scenario, but it also sparked funny scenes—for example, when the daughter, who’s clumsy, would get invited into somebody’s home and then stumble around and break all their stuff. It’s a great point. Games can tackle serious subjects—see again: Train—but you have to deal with the fact that putting serious subjects in a game can make them funny, if only for the incongruity. Before I make fun of Schafer for having the same sense of humor as my four-year-old, let me throw in a quote on what makes humor work in a game: when you weave it in with everything else. “That’s the way life is,” Schafer said, “all of our lives are touched by tragedy and funny things every day. I just think that’s interesting to do in writing.” When we think of Schafer’s funny games, we tend to talk about his writing on the original Monkey Island titles or his DoubleFine titles like Psychonauts or Brutal Legend. But my favorite Schafer game is Grim Fandango, the story of a grim reaper in an Aztec-meets-Bogart land of the dead. It doesn’t play as a straight-up comedy, because you focus on your affection for the characters and their story. The dialogue is funny in a way that you’ll never grow out of, but the jokes also work because they make you pause to remember how much you love the characters telling them. Reason two: the game’s puzzles can make you smile. The game’s best moment—and I won’t give away the details—comes when you’re grappling with an infuriating, multi-part puzzle, and right when you’re tearing your hair out, you realize that a trivial detail that’s been sitting in front of you the entire time is the key to the entire shebang. It is a boffo punchline. The crowded room got laughs and takeaways; this was one of the best sessions of my week. And I want to thank John again for having me on board this week. GDC was exhausting, amazing, exhilarating, silly and grueling—but covering it here makes it way more fun.